IF EVERY quality save is effectively worth a goal, Neil Alexander, the veteran Hearts goalkeeper, must be up there with the Tynecastle club’s most valuable marksmen. There was certainly no questioning the importance of the former Rangers and Cardiff City keeper’s contribution on Saturday, as Hearts’ early-season bandwagon rolled on. When Alexander denied Michael Gardyne’s early powerful attempt at the Global Energy Stadium it proved pivotal in ensuring County’s initial exuberance went unrewarded. From there, it was the capital club who took the initiative with an inspired Osman Sow run and finish and Alim Ozturk’s opportunist second, all within the first 14 minutes. Alexander was powerless to stop Liam Boyce netting from a penalty before half-time but, all in all, turned in the kind of calm, authoritative display that breathes assurance into defences. 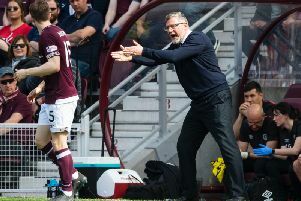 Hearts – now with four wins from four and sitting pretty at the top of the table – can be thankful his powers show no signs of waning. Alexander would tell you he was only doing the job he was paid for on Saturday but, after a contribution richly-praised by manager Robbie Neilson, acknowledged the early stop had been vital. “It’s important to make saves at any point in the game, but you never want to concede a goal early,” Alexander said. “[The save] gave the boys a lift. We went up the other end and scored a couple of great goals and we were full of confidence. Hearts have brought with them all the classic momentum of second-tier champions, alloyed to the trappings of a big club. It looks like it could be a potent mix. On Saturday 1,391 visiting fans packed out the North Stand and turned the occasion into a “home” atmosphere. “We are delighted. It was a hard-fought win,” Alexander said. “I thought for the first half an hour of the game we were outstanding. That won us the three points, really. “The penalty has changed the game a wee bit, but the boys did fantastically well to hang on against a very good Ross County team. “We’ve got a fantastic dressing room and a great winning mentality in the place, which has carried on from last season. “That’s really pleasing, as we’ve brought a lot of new players in too. The boys are winners and it’s a fantastic place to be at the minute. “All the boys feel lucky to be at the club, there’s a lot of good things happening and the future looks well for the club. “But the boys realise that we’ve got to work hard. There’s a lot of strength in depth in the squad, so nobody can take their place for granted. Neilson later described the second half as an exercise in “game management” by Hearts and it was true that County never really found the cutting edge to match their overall dominance after the break. The first half, certainly, could have shaped up differently for Jim McIntyre’s side with just a little more luck. There was a hunger evident in the hosts at the outset as Gardyne snapped in his fourth-minute effort and was thwarted by Alexander’s parry and Boyce’s blast was also held by the keeper. Neilson had switched the tall and pacy Sow to an unfamiliar wide right role and it looked like a masterstroke as the opener materialised. The 25-year-old Swede surged away from several challenges on the flank and then cut inside on to his left foot to beat Scott Fox superbly at his near post from the edge of the area. Hearts can play a bit but their physicality was also striking as they took a dominant hold. Again, the manager’s stamp was on the move that brought the second from a 14th-minute corner, although County manager McIntyre complained later that his team had been forewarned of the tactic. The excellent Jamie Walker’s long corner found Callum Paterson arriving unmarked at the back of the box and his strike might well have found the net all by itself had Ozturk not helped it in with a neat flick. Only when Igor Rossi hauled down Jackson Irvine in the box as he made for a Rafa De Vita free-kick after 38 minutes did County claw a way back into the game. Boyce sent Alexander the wrong way for his first goal of the season, but, in the second period, a beautifully-timed overhead kick connection by the Northern Irishman that flew wide was the closest County came to levelling. Irvine, the County midfielder, was nursing a split toe after hostilities but admitted the Dingwall team’s second defeat of the season hurt more. “The result was a sore one to take, very disappointing,” the athletic Australian admitted. “You want to take the positives from the game but losing early goals seems to be something we have been doing too often. “We gave away too many opportunities. Take nothing away from Osman Sow, that was a great strike and a great goal, but the second one was criminal for no-one to have spotted the late run. “But credit to the lads for digging in and fighting our way back into the game. It was a stonewall penalty and I think we dominated the game after that. “You could see the relief from the Hearts players at the end when they fell to their knees.